SAN JOSE, Calif., Jan. 9, 2019 /PRNewswire/ -- MGI, a subsidiary of global genomics leader BGI Group, announced pricing and its first early access customer for the new ultra high-throughput sequencer, MGISEQ-T7, saying it has driven down sequencing cost to $5 per gigabyte, with exceptionally high accuracy. Such innovations are helping more people to realize the benefits of genomic information. 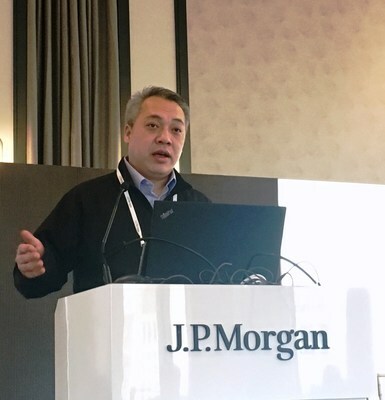 "Every individual deserves a sequenced genome that is affordable and accurate," said MGI President Duncan Yu, presenting during the 37th annual J.P. Morgan Healthcare Conference this morning. "MGI's technical breakthroughs are making a genome for all possible, and bringing the power of choice to the market." MGI also announced the MGI global sequencer user program to support collaborators to begin using the T7. MGI has successfully signed up WeGene, one of the largest companies providing direct-to-consumer genetics testing in China, as the first user of MGISEQ-T7. Based on this platform, WeGene plans to promote applications of WGS in the DTC market. Using MGISEQ-T7, WeGene plans to complete more than 40,000 whole genomes sequenced this year and more than 120,000 whole genomes sequenced in 2020. In October, MGI launched the MGISEQ-T7, a highly flexible production-scale platform that is the most powerful sequencer to date. It can produce as many as 60 whole human genomes in one day. The instrument sells for $1 million. The T7 enables simultaneous but independent operation of up to four flow cells, which means different applications such as single-cell RNA sequencing, whole exome sequencing and whole genome sequencing can be run in different flow cells at the same time. This helps to reduce costs, allowing MGI to offer the most competitive sequencing price in the market. MGI also introduced two key technologies that help deliver even greater accuracy. MGI's DNBseq™ patented technology from Complete Genomics uses rolling circle replication and patterned array technology. Combined with our PCR-free sample preparation method, this total solution delivers more accurate sequencing data, with enhanced and stable performance. Powered by DNBseq™, MGISEQ delivers quality data with accuracy for SNP and Indel calling rate of 99.9% and 99%, respectively, along with decreased duplication rate down to less than 2 percent, and almost zero Index mis-assignment rate. MGI's single-tube long fragment read (stLFR) technology, which can generate short reads and long reads in one library in a single run, is a new method that delivers an even more accurate WGS, significantly reduces the cost and simplifies the process of preparing samples. The stLFR technology enables high-quality mutation detection, diploid genome phasing, structural variation analysis and other long-length applications. In his presentation at J.P. Morgan Healthcare Conference, Mr. Yu also told the growth story of MGI. By the end of 2018, MGI had delivered over 1,000 sequencers to more than 250 users in 16 countries. It has grown to 800 employees and is building up sales support teams and centers across the world. MGI also has more than 240 patents granted globally. In the China market, MGI has six different sequencers licensed, and a market share of 35%. The MGI platform is gaining support around the world, with more than 135 publications using MGI sequencers and over 20 petabytes of data generated.